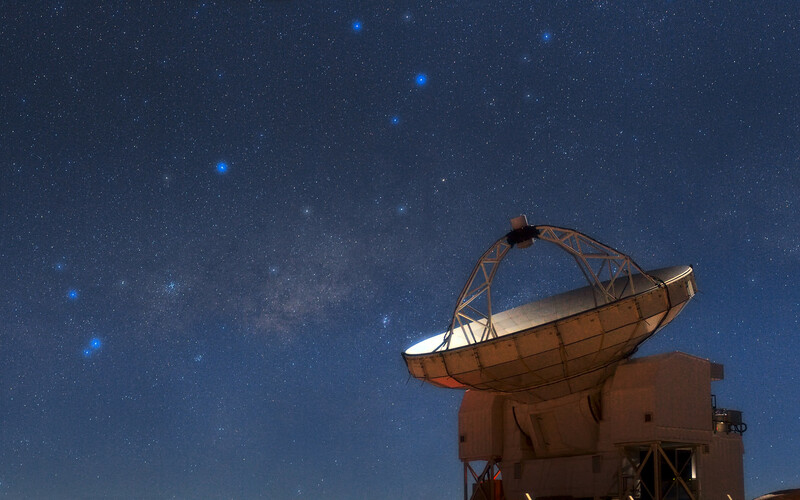 The Atacama Pathfinder Experiment (APEX) telescope looks skyward during a bright, moonlit night on Chajnantor, one of the highest and driest observatory sites in the world. 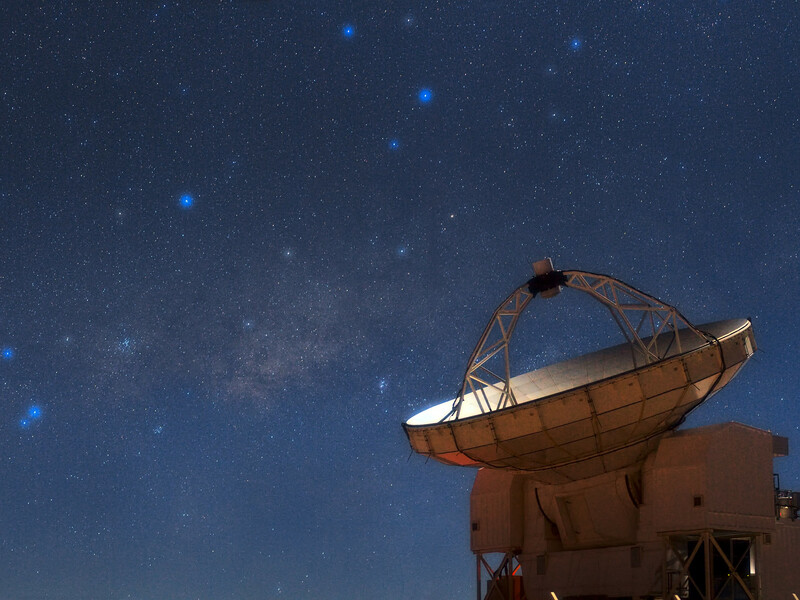 Astronomical treasures fill the sky above the telescope, a testament to the excellent conditions offered by this site in Chile’s Atacama region. On the left shine the stars that make up the tail of the constellation of Scorpius (The Scorpion). The scorpion’s “stinger” is represented by the two bright stars that are particularly close to each other. Reaching across the sky and looking like a band of faint, glowing clouds is the plane of the Milky Way. Between Scorpius and the next constellation to the right, Sagittarius (The Archer), which looms over APEX’s dish, a sparkling cluster of stars can be clearly seen. This is the open cluster Messier 7, also known as Ptolemy’s Cluster. Below Messier 7 and slightly to the right is the Butterfly Cluster, Messier 6. Further to the right, just above the edge of APEX’s dish, is a faint cloud which looks like a bright smudge. This is the famous Lagoon Nebula (see eso0936 for a closer view). With a primary dish diameter of 12 metres, APEX is the largest single-dish submillimetre-wavelength telescope operating in the southern hemisphere. As the telescope’s name suggests, it is blazing a trail for the biggest submillimetre observatory in the world, the Atacama Large Millimeter/submillimeter Array (ALMA), which will be completed in 2013 (eso1137). APEX will share space with the 66 antennas of ALMA on the 5000-metre-high Chajnantor plateau in Chile. The APEX telescope is based on a prototype antenna constructed for the ALMA project, and it will find many targets that ALMA will be able to study in great detail. ESO Photo Ambassador Babak Tafreshi made this panorama using a telephoto lens. Babak is also the founder of The World At Night, a programme to create and exhibit a collection of stunning photographs and time-lapse videos of the world’s most beautiful and historic sites against a nighttime backdrop of stars, planets and celestial events. APEX is a collaboration between the Max-Planck-Institut für Radioastronomie (MPIfR), the Onsala Space Observatory (OSO), and ESO, with operations of the telescope entrusted to ESO.